The Made in Britain Workshop series is designed for manufacturers to benefit, and one way that members contribute to these events is with the opportunity to SHOWCASE their products in the MiB Goody Bag. At every workshop we give delegates a Made in Britain bag packed with samples of products our members are making. Some members choose to include a Special Offer flyer with a traceable offer code. Delegates also receive their own delegate name badge pass which can be re-used at our events and others. 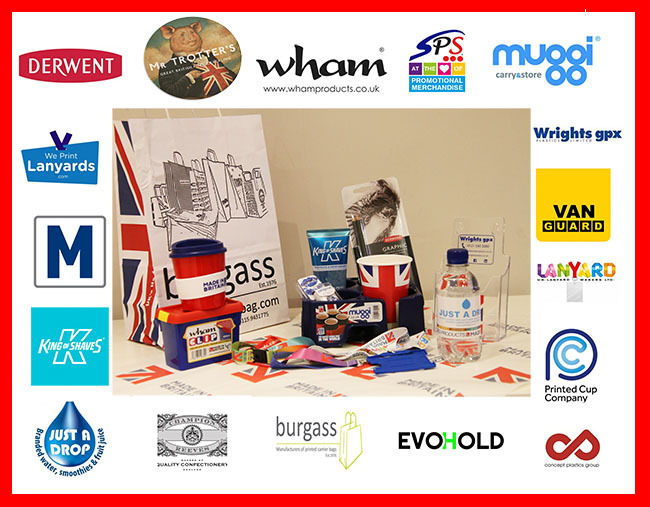 In 2017 we were able to showcase products from Muggi, Wham, Mr Trotter, Champion and Reeve, Wrights Plastics, Derwent, SPS EU, UK Lanyards and We Print Lanyards, The Printed Cup Company, Justadrop, Evohold and Magicard with all these items going into a re-useable gift bag provided by Burgass Carrier Bags. In 2018 we'd like to offer an even wider variety of exciting MiB products so all our members know what our members are making. Helping Britain's manufacturers sell more with one marque.